Don’t let insects ruin your lawn! A beautiful, healthy lawn looks great and makes your home look even better. But if your lawn is vulnerable to pests, you could end up with a yard that’s dead, brown, and uninviting. But there are several varieties of pets that you can look out for and be prepared to treat to keep your lawn healthy. 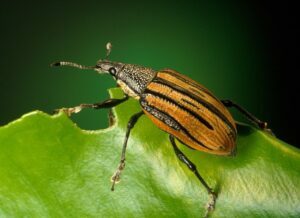 Grubs, or beetle larvae, can be extremely destructive to your lawn. White grubs, or phyllophaga, are the larvae of several types of scarabs like Japanese beetles. These pests, which are generally c-shaped and can be found below the soil eating the grass roots. The life cycle of a white grub is about a year. They tend to lay eggs midsummer, hatching two weeks later to start feeding on grass roots, eventually burrowing to lay dormant through the winter. The grubs return to the surface in spring to continue feeding before mating in the midsummer. You can spot grub damage in wilted grass blades and brown, dying and dead patches of grass. Grass will lift easily out of the soil and animals like skunks and crows may be spotted in your lawn feeding on the grubs. Chinch bugs also feed on grass and can be found all across the country. They produce multiple generations during their life cycle from springtime to the early fall, and the nymphs (or young chinch bugs) grow to maturity in as quickly as four weeks. They also lay dormant for the winter to begin feeding again in the spring. You’re most likely to spot chinch bug damage from the midsummer to September. Patches of grass wilt and become very dry and brown where chinch bugs feed since when they feed their secretions cause grass to stop absorbing water. Sod webworms are moth larvae that grow to about an inch in length and are usually brown or green in color. The moths lay multiple generations of eggs through the spring and summer on the blades of grass. It takes about five weeks for the larvae to grow into moths. Large brown patches could point to sod webworms in your lawn, and they happen quickly. Look out for silken tunnels at the base of your turf for signs of sod webworms. Armyworms are 1 to 2 inches in length and can be various colors. Eventually, these too become moths, producing multiple generations of eggs laid in clusters of small, white eggs. They hatch within a week and turn into moths in as quickly as two weeks. Armyworms eat the stems and blades of grass during the night, creating circular bare spots. Cutworms are quite large at about 2 inches in length, usually grey or brown with stripes, eventually becoming moths to lay eggs in the spring on the tips of grass blades. Cutworms grow into moths in 2 to 4 weeks. Their burrows, as well as shortly cut grass, are signs to look for. For help with your lawn and all your pest care needs, the team at Atlantic Maintenance has you covered. Atlantic Maintenance Group is a full-service landscaping company, providing maintenance, design, and construction, as well as snow removal, asphalt and concrete services. To get your free quote today, give us a call at 410-768-4720 or contact us via our website today. You can also follow us on Facebook, Twitter, Pinterest, and Google+ to see how we’re growing! This entry was posted on Friday, May 4th, 2018	at 1:34 pm	and is filed under Lawn Tips	. You can follow any responses to this entry through the RSS 2.0	feed. Both comments and pings are currently closed.